Convert EDB file emails in bulk EDB to MSG file format. Search automatically for EDB file in the user machine. Robust search features to scan and analyze EDB emails. Naming conventions feature to manage bulk EDB mails. In menu bar click on scan file button and then select edb file type. Browse file from local storage. Select exchange database file/folders to export. Choose MSG file from list and apply feature option by using checkbox and then browse location to save msg file. Click OK to start the process. I am working as the assistant server administrator at a Multinational organization. I mistakenly shut down the system due to which the server goes down. When I restart it, then I am not able to access my data, it shows error Operation terminated- Database Dirty Shutdown. The database is in an inconsistent state. I run the inbuilt utility to check and correct the issues. But the result is not satisfactory. So I raised the problem in front of my seniors, they advised me to retrieve the data somehow. Otherwise, you have to face serious consequences of this mistake in coming days. So I decided to convert the 25 GB of data to another format. Can I able to transfer my complete data to MSG format? What is estimated time to convert 25 GB of EDB file to MSG? Does Live Exchange Environment requires for conversion? Does the software maintain folder hierarchy of EDB files? Can I able to recover corrupted EDB file? Is software preserve metadata also? The EDBs to MSG Converter Software is professionally built and technically proof software to convert bulk edb mailboxes to msg file. 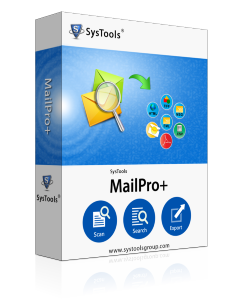 It contains dazzling features such as powerful search option, multiple preview modes for edb mailboxes analysis and much more. NSF to MSG converter convert all data contained in edb file to msg. The live exchange environment is not needed to convert the edb mailboxes to msg. 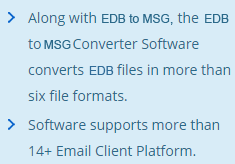 The nsf to msg conversion tool maintains the folder sequence of edb email intact after the conversion of edb to msg. It also recovers edb data from corrupted edb file and allows you to export edb to msg file format. It quickly convert 2gb of edb data to msg with 2Mbps speed. Is there a limitation on the number of EDB mails that need to be converted? No,there is no limitation on the number of EDB emails that need to be converted to MSG format. How can I exclude the duplicate emails in EDB file from being converted to MSG format? You can do so by selecting Exclude Duplicates option from the export options. 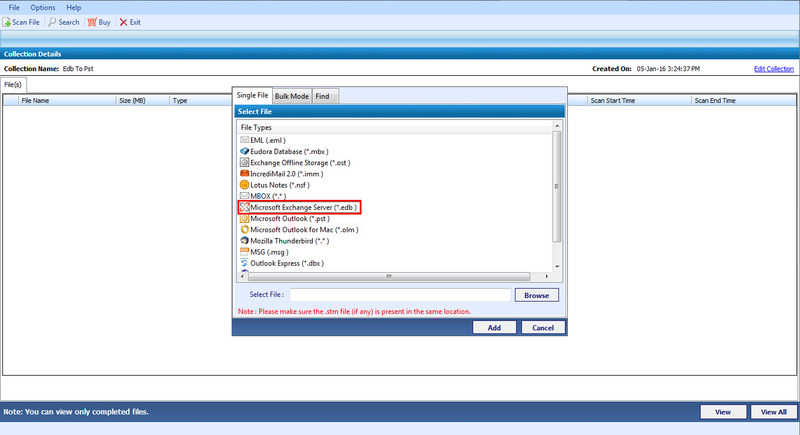 Will the EDB to MSG Converter software maintain the folder hierarchy of the EDB emails intact after conversion to MSG? Yes, the folder hierarchy of EDB file will be maintained after conversion to MSG file. I don't know the exact location of my EDB files. Does it automatically detects EDB Mailboxes form my system? Yes, the EDB to MSG Converter tool is smart enough to automatically detect the EDB Mailboxes from your system. There is the certain unavoidable situation which had the great impact on the health of Exchange edb file such as jet engine error, Log file Error, Database corruption, synchronizing error, system shut down the error. This error leads the data loss or inaccessibility to crucial data. The best solution is to retrieve data from corrupt edb file is to use EDB to MSG Converter. It helps you to convert edb to msg and enable you to preview it on the other platform.